Space Quilt (left, front) on display at the National Quilt Museum, Paducah, Kentucky. Photo courtesy of National Quilt Museum. If you're ever in Paducah, Kentucky, be sure to stop by the National Quilt Museum. You will be amazed at at the quilts that are on display -- true masterpieces of art. 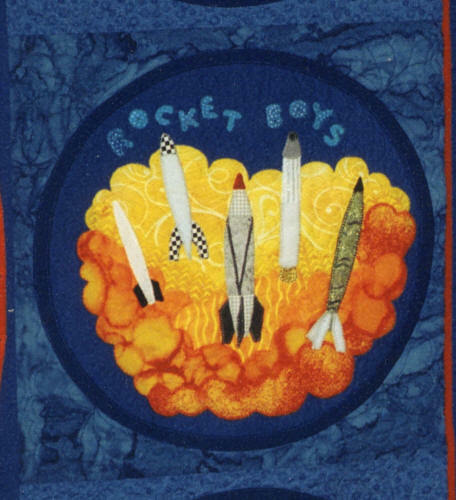 Of particular interest to Rocket Boys fans is the Space Quilt by Sue Nickels and Pat Holly. Please note: even though the Space Quilt is part of the permanent collection of the National Quilt Museum, it is not always on display. After a certain amount of time, quilts must be taken down, carefully folded, boxed and moved to storage in the climate-controlled vault at the museum. This gives the fabric in the quilt a rest from hanging on the wall. Quilts at the National Quilt Museum rotate in and out of storage. If seeing the Space Quilt is of prime importance to you, please call the museum in advance to make sure the quilt will be on display during your visit. Photo courtesy of Pat Holly and Sue Nickels. Space Quilt by Sue Nickels and Pat Holly. 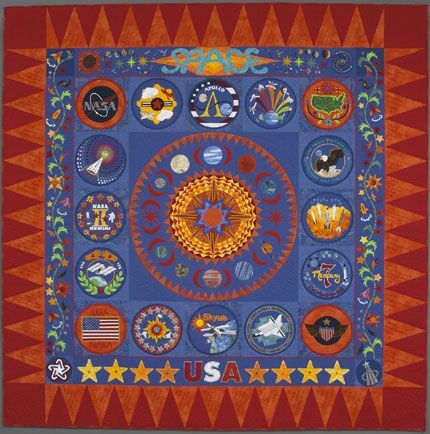 2003 International Quilt Association, Master Award for Machine Artistry. 2004 American Quilters Society, Machine Workmanship Award. In the collection of the National Quilt Museum, Paducah, Kentucky. Machine pieced, appliquéd and quilted. Cotton fabric, cotton threads and cotton blend batting. Sue and Pat made this quilt as a tribute to their father, Gerald Holly and as a way of promoting an interest in the U.S. Space Program. Their father was an Army Air Force (AAF) pilot in World War II and a test pilot in the 1950s. After he retired from the Air Force, he encouraged the sisters' interest in the U.S. Space Program by watching all the early launches, culminating in the first man to walk on the moon. It was a good time to make the quilt as NASA has seen many challenges. Pat and Sue feel strongly in space exploration and hope this quilt will help keep it in the public’s eye. The quilt uses stitched raw edge machine appliqué. The appliqué was divided equally between the sisters, using original interpretations of all important aspects of the space program. Pat did much of the piecing and Sue did most of the machine quilting. An interesting part of the quilt is the dogtooth border. In free motion writing, Sue stitched all the individual missions, dates and the names of the astronauts that flew them in the orange flag areas. It is a true history lesson. Pat’s solar system in the center area was completely machine appliquéd! The quilt is in an honored spot at the museum in Paducah, along with its sister- The Beatles Quilt! Sue forwarded your email to me to answer your questions. We loved the book Rocket Boys and the movie – what a great true story! We met a quilter/rocket scientist from Huntsville, Alabama, and she got us copies of the book signed by Homer Hickam…. So cool! The “Rocket Boys” block was my design and I wanted to pay tribute to all the scientists who worked on the rockets that eventually were used in the space program (Werner Von Braun, et al.). I loved that Homer Hickam’s book also applauded those engineers and am happy that you realized that reference. When making these “theme” quilts, I try to research the subject as best I can and look for imagery we can use. We did contact NASA before starting the quilt, and they sent us a bunch of information and pictures! As we taxpayers pay for this, there is really no “copyright” issue. Sue and I lived in Livonia, Michigan from 1959 – 1968. We remember watching the launches from our home or in the cafeteria of our elementary school. Our father was a P-38 pilot in the Pacific during WWII, as well as a test pilot in the early ‘50’s, so he was a great supporter of the space program. We definitely were influenced by his input. I was 16 years old when watching Neil Armstrong take that first step on the moon – an incredible moment! Hope this helps and if you have any other questions, please feel free to contact me. Pat writes, "This block was made to honor the scientists and engineers who developed the rocket engines that got us into space. The images are very rough ideas of some of those early rockets. Starting from the left, I think I got this image from an early Soviet rocket, GIRD 09. The second from the left was from a photo I found of Wernher von Braun at age 18 holding a small rocket. The center rocket represents the V2 Rockets, developed in Germany and brought to the US after World War II. Second from the right represents the Explorer I rocket. The last one I think was for Robert Goddard, although I couldn’t unearth in my research where that image came from…. When Sue and I make one of these complex “theme” quilts, we try to research the topic and find inspiration to create images that will translate into fabric. Sometimes it takes a bit of imagination!" The YouTube video above shows Pat and Sue discussing another quilt. However, there is a mention of the Space Quilt and a lot of interesting information on how these sisters make quilts together -- even though they live 170 miles apart!